The holiday season is full of delicious treats. Aside from rum spiked eggnog, candy canes, fruitcake, shortbread and cranberry sauce, one of my favorite Christmas treats is gingerbread. Whether you enjoy biting the limbs off a gingerbread man or munching on the roof of a gingerbread house, you cannot escape the wonderful aroma and flavor of ginger and cinnamon. These fragrant spices can be easily examined by NMR spectroscopy. 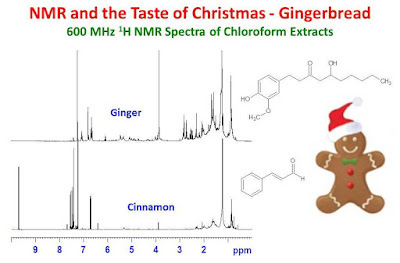 The figure below shows the 600 MHz 1H NMR spectra of CDCl3 extracts of ground ginger (top) and ground cinnamon (bottom). The main constituents of these extracts are 6-gingerol and cinnamaldehyde for the ginger and cinnamon extracts, respectively. 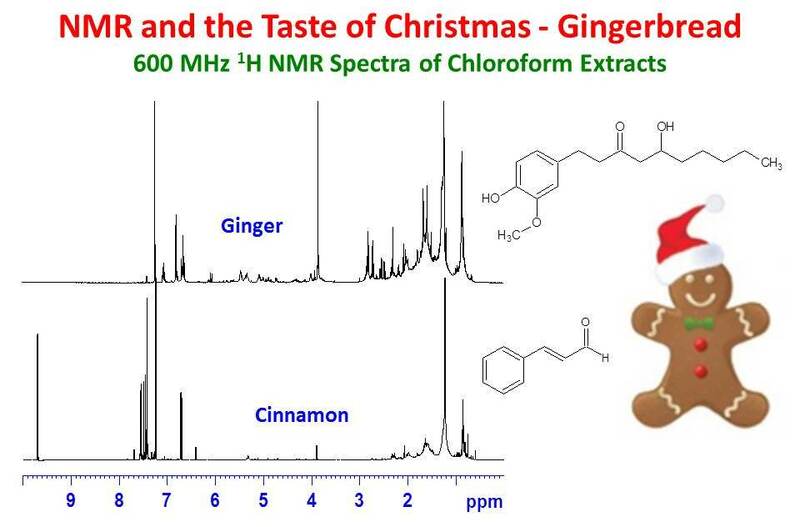 Think of these compounds and their NMR spectra while you bite the head off your next gingerbread man in front of your beautifully decorated Christmas tree. Merry Christmas! 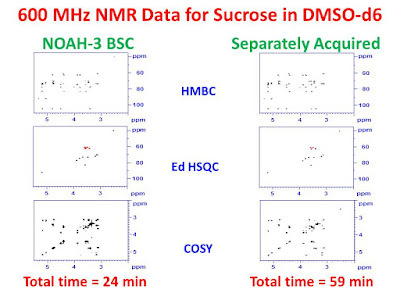 NMR users typically run 1H, 13C, COSY, HSQC, HMBC and NOESY spectra to elucidate the structures of small molecules. Even with cryogenically cooled probes and pulsed field gradient accelerated methods, collecting 2D spectra can be quite time consuming. For concentrated samples, each 2D experiment will typically take minutes to tens of minutes to collect. Much of this time is the result of waiting for T1 relaxation in each of the experiments. Recently, Kupce and Claridge1,2 have developed a technique using standard NMR hardware where multiple 2D methods are concatenated in a single super pulse sequence employing a single relaxation delay. They have called the technique NOAH (NMR by Ordered Acquisition using 1H detection) The time saving of the NOAH technique compared to individually collected 2D spectra results from waiting a single relaxation delay for all experiments rather than a single relaxation delay for each separately acquired spectrum. The data for each spectrum is acquired in separate memory blocks which are separated after data collection allowing the data for each 2D method to be processed individually. The data can also be processed in automation. The authors have kindly made this method accessible to all Bruker users through the Bruker User Library which contains pulse sequences, parameter sets, automation scripts and detailed instructions. 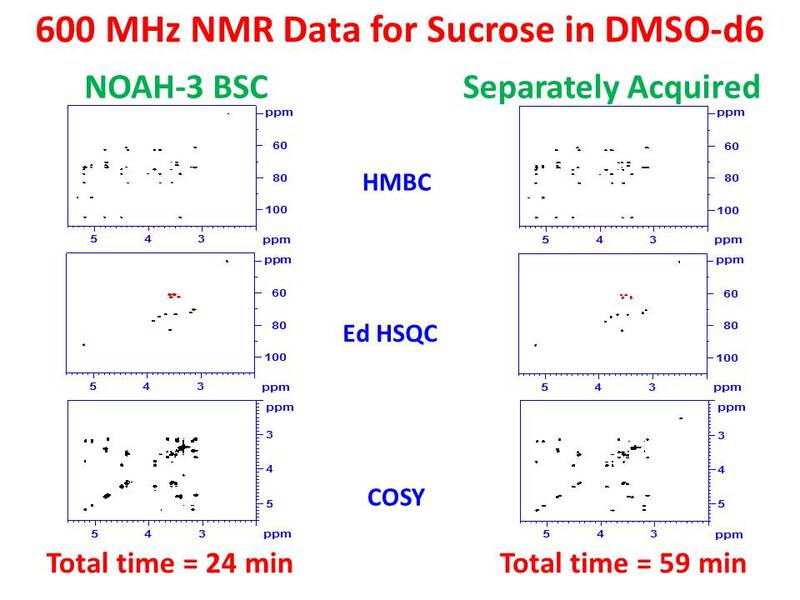 The left-hand panel of the figure below shows the 600 MHz HMBC, Ed-HSQC and COSY spectra obtained from the NOAH-3 BSC (HMBC, HSQC, COSY) pulse sequence for sucrose in DMSO-d6. The right-hand panel shows separately acquired 2D data sets for comparison. The NOAH spectra were obtained from the raw concatenated data with the automation script provided. The high quality NOAH-3 data using 2 scans, 256 increments and a 2 second relaxation delay, took only 24 minutes to acquire in comparison to the separately acquired 2D spectra obtained with similar parameters, which took a total of 59 minutes to acquire. This represents a time saving of 35 minutes or 59%. It should also be noted that the data from the NOAH-3 BSC sequence is of comparable quality to that of the individually collected spectra. 1. Eriks Kupce and Tim D. W. Claridge. Chem. Commun. 54, 7139 (2018). 2. Eriks Kupce and Tim D. W. Claridge. Angew. Chem. Int. Ed., 56, 11779 (2017). The amplitude of the 2H lock signal provides information for an electronic feedback circuit which continuously corrects the magnetic field strength (by way of a B0 shim) to compensate for environmental instability. A poor 2H lock signal will provide unreliable input for the feedback circuit and B0 compensation will be erratic. 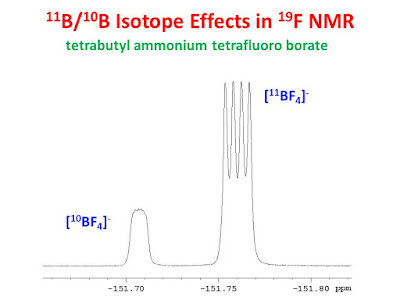 This leads to undesirable effects in NMR spectra. For example, noisy lock signals will lead to undesirable noise at the base of the observed NMR peaks. If one uses too much lock power, the 2H lock signal gets saturated and the lock amplitude is unstable. 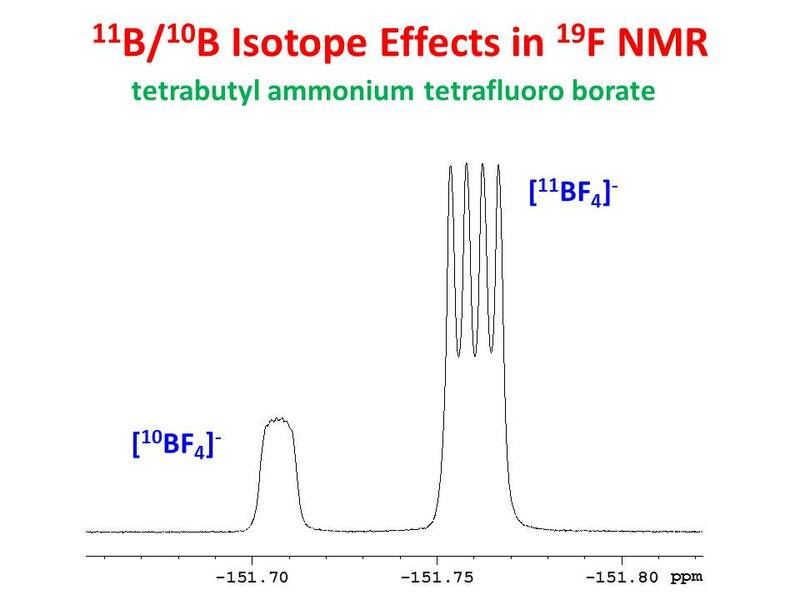 A saturated 2H lock will lead to problems in the NMR spectrum since the input to the B0 compensation feedback circuit is unstable. This is demonstrated in the figure below. When one scan is collected, there are spectral distortions at the base of the NMR resonances. When 16 scans are collected these artifacts average to produce a general broadening at the base of the NMR resonances. 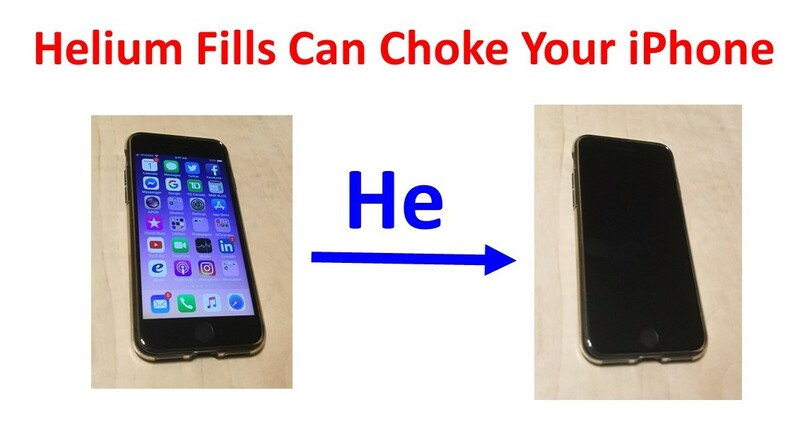 Be careful not to saturate the 2H lock. 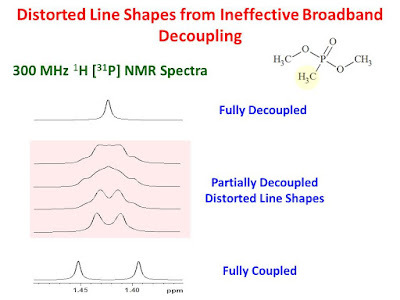 In a previous post, it was shown that distorted line shapes are obtained for resonances in broadband decoupled NMR spectra when the resonances of the decoupled nuclide are outside of the effective decoupling bandwidth. 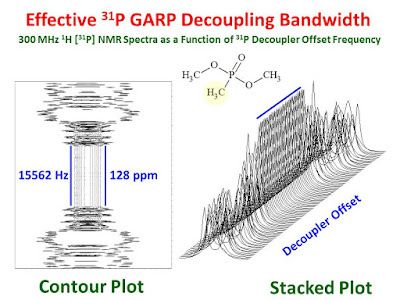 This can be a particularly difficult problem when observing 1H NMR spectra with 19F decoupling. 19F has a large chemicals shift range so, if there are multiple widely spaced 19F resonances, it will be difficult or impossible to decouple all 19F sites at once, particularly at higher magnetic field strengths. If one is not aware of this problem, data misinterpretation may be an issue as distorted line shapes will lead incorrect splittings used to measure coupling constants. The figure below illustrates this problem. 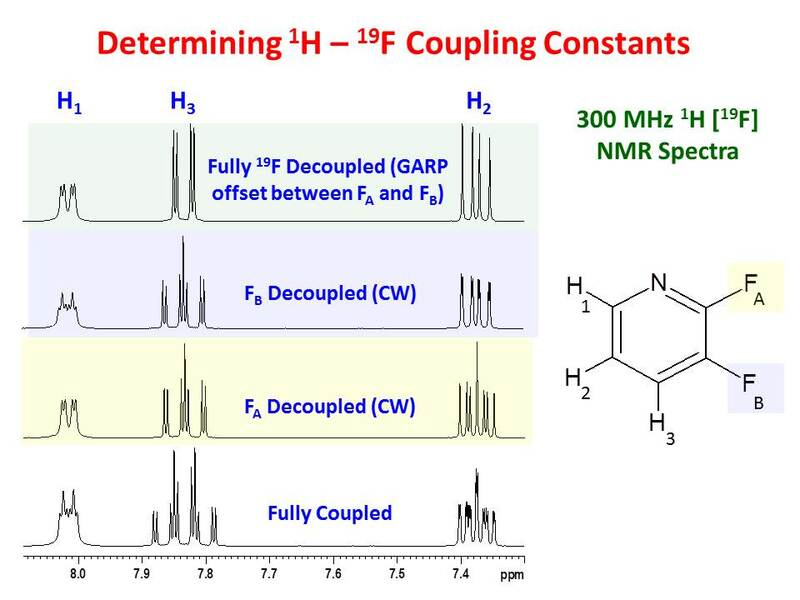 The top three panels of the figure show the 300 MHz 1H[19F] NMR spectra for the three 1H resonances of 1,2-difluoropyridine as a function of the 19F decoupler offset. The GARP decoupling scheme was used with 90° pulses of 80 µsec. The decoupler offsets, depicted in the bottom panel of the figure, were varied in 5 ppm increments. Of the 11 decoupler offsets used, only offset 6 (at -116 ppm) effectively decoupled both 19F sites. Varying the decoupler offset by only ± 5 ppm leads to distorted line shapes, which are particularly pronounced for the H3 resonance. These distorted line shapes could easily lead to data misinterpretation and erroneous coupling constants. In this case, the 19F decoupling bandwidth is 55 ppm. Since the chemical shift difference between the two 19F resonances is 52 ppm, one is able to obtain a fully 19F decoupled 1H spectrum with the careful choice of the decoupler offset frequency however, there will be cases where the decoupling bandwidth would not be sufficient to decouple all 19F resonances in some molecules. 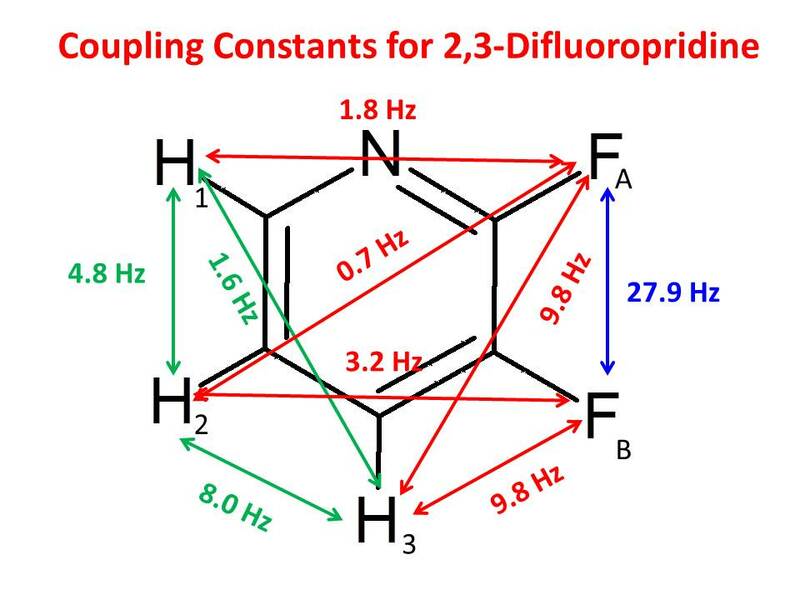 How then can one generally evaluate all of the coupling constants in fluorine containing molecules? The 19F-19F couplings can be evaluated in a 19F[1H] spectrum (not shown). Specific 1H-19F coupling constants can be determined by measuring a 1H PSYCHE spectrum or be collecting 1H spectra with selective 19F continuous wave (CW) decoupling for each of the19F resonances. The latter is shown in the figure below. The bottom panel shows a standard 1H spectrum. The middle two panels show the 1H spectra for each of the 19F sites decoupled separately using CW decoupling. The top panel shows the fully 19F decoupled spectrum. Using these data, all of the coupling constants can be evaluated and are shown in the figure below. 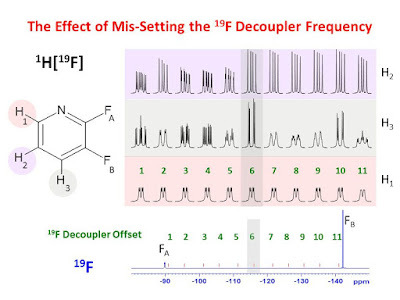 In conclusion, one must be careful in interpreting 1H[19F] spectra and understand the limits of the 19F decoupling scheme used. Broadband X nucleus decoupling (X = 13C, 15N, 31P, 11B, 19F etc.....) is frequently used in 1H detected 2D HSQC/HMQC data collection or in standard 1D 1H spectra to aid in structure assignment. When broadband decoupling schemes are used, one must keep in mind that they are not infinitely broadbanded. They have finite bandwidths over which they are effective thus limiting the chemical shift range for the decoupled nuclide. The effective bandwidth depends on the particular decoupling scheme and the decoupling power used. If multiple peaks are to be decoupled, one must insure that all peaks are within the decoupler bandwidth. One can determine experimentally the effective decoupling bandwidth by running a series of 1H spectra varying the decoupler offset frequency. Such a measurement is shown in the figure below for the P-CH3 methyl resonance of dimethyl methylphosphonate. 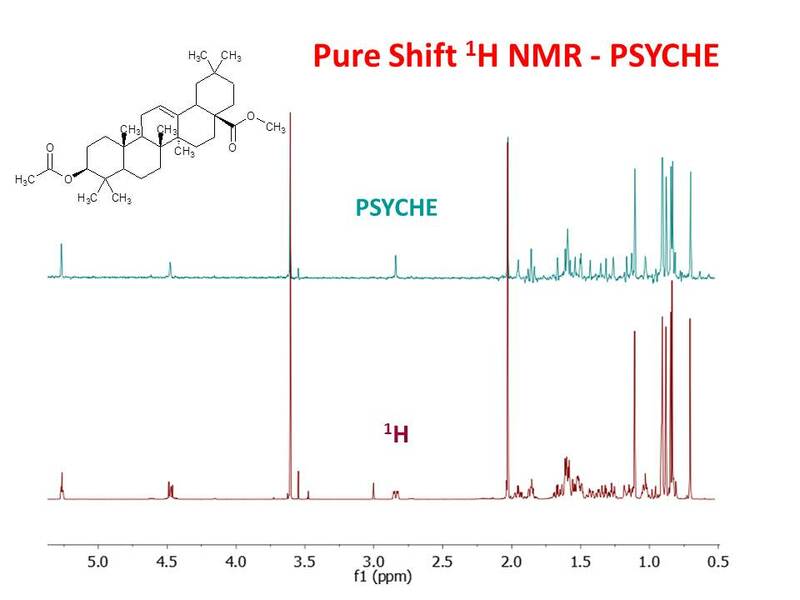 300 MHz 1H [31P] NMR spectra were collected in a pseudo-2D fashion, incrementing the decoupler offset frequency from 200 ppm to -200 ppm from the 31P resonance frequency in 1 ppm steps. 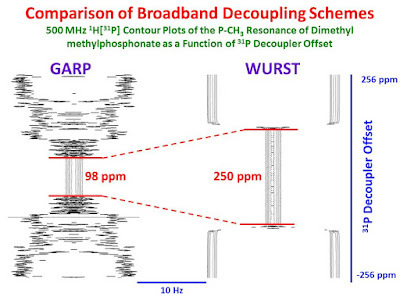 Broadband GARP decoupling was employed with a power of 3125 Hz (80 µsec 90° pulses). The pseudo-2D contour plot is shown in the left-hand panel and a stacked plot is shown in the right-hand panel. One can see that the effective decoupling bandwidth is 15.56 kHz or 128 ppm on a 300 MHz instrument. When the decoupler offset exceeds ±64 ppm from the 31P resonance frequency, one obtains distorted line shapes. Representative distorted line shapes are shown in the figure below. The bottom spectrum was collected with no 31P decoupling. 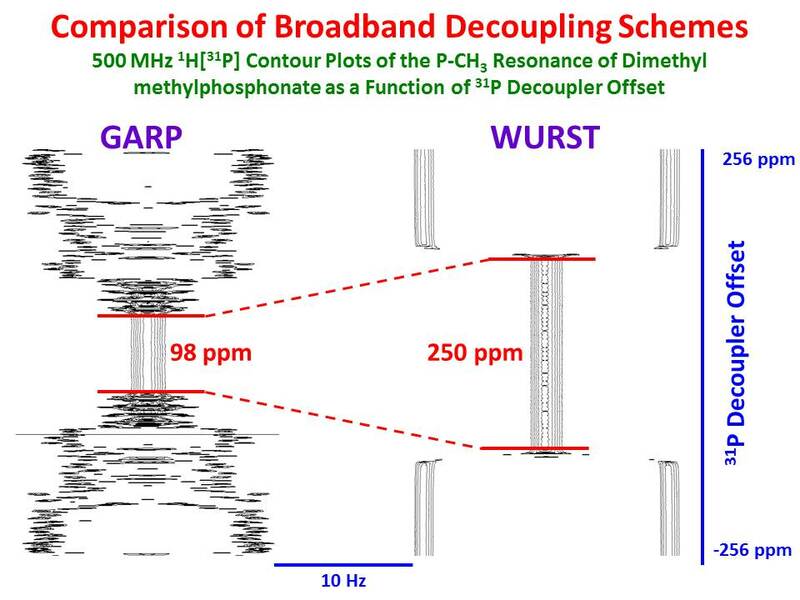 The top, fully decoupled spectrum was collected with on-resonance 31P GARP decoupling. The middle spectra, highlighted in pink, are representative distorted spectra outside of the effective decoupling bandwidth. If one is not aware of the decoupling offset and available bandwidth, one may obtain misleading line shapes subject to misinterpretation. Some common household products contain many NMR active nuclides able to provide information on the identify the major components of the product. Toothpaste is such an example. It contains abrasives, surfactants, cleansers, fluoride, sweeteners, foaming agents, flavors, etc.... A survey of some of the NMR active nuclides can reveal the major components. 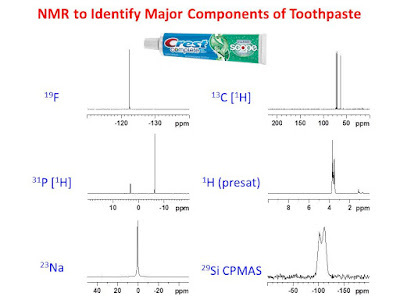 The figure below shows the 19F, 31P, 23Na, 13C and 1H NMR spectra of a D2O slurry of Crest Complete toothpaste acquired on a 300 MHz spectrometer as well as the 29Si CP/MAS NMR spectrum of a sample of dried Crest Complete toothpaste, collected on a 200 MHz spectrometer. Except for the 29Si CP/MAS spectrum, which was collected over several hours, all other spectra were collected in a matter of minutes. The 19F spectrum is consistent with the fluoride ion which is a well known agent for preventing tooth decay. 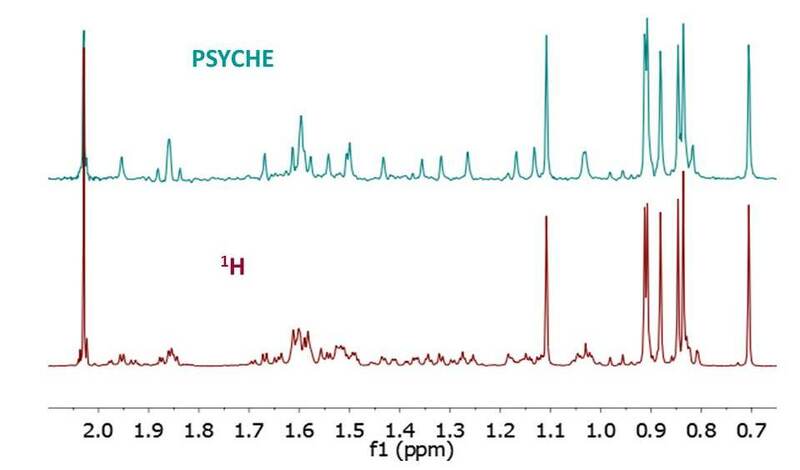 The 31P spectrum collected with 1H decoupling shows two major peaks consistent with diphosphate and phosphate anions. Salts of these anions are used as water retention agents, stabilizers and emulsifiers. The 23Na spectrum shows a single peak consistent with sodium cations, balancing the charge for the fluoride, diphosphate and phosphate anions. The 13C and 1H NMR spectra show one major component consistent with sorbitol, commonly used as a sweetener. Other minor components are evident in both the aliphatic and aromatic regions of the 1H and 13C spectra. 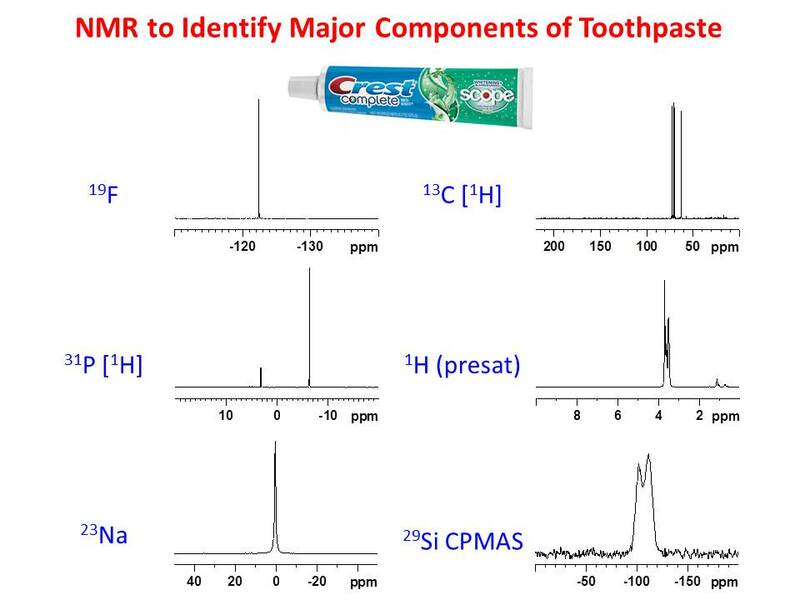 The 29Si CP/MAS spectrum of the dried toothpaste is consistent with silica, which is used as an abrasive. The two peaks are due to Q4 (Si(OSi)4) and Q3 (Si(OH)(0Si)3) silicon sites. It should be noted that there are many other components including flavoring agents, coloring agents and preservatives present in concentrations which would require much more time and attention to identify. Presaturation is one of the most common methods of solvent suppression. A long selective low power pulse is applied at the solvent frequency followed by a hard non-selective read pulse (or composite pulse). 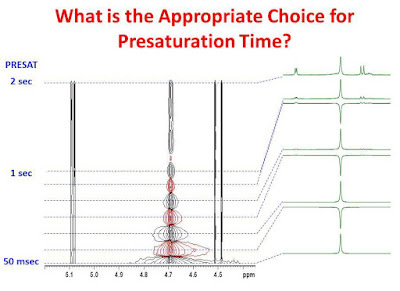 Aside from a well-shimmed homogeneous magnet, there are two important parameters required for effective presaturation: saturation power and saturation time. The selection of saturation power was addressed in a previous post. With a properly selected saturation power, the appropriate choice for the saturation time depends on the relaxation properties of the solvent and the B1 field inhomogeneity of the probe. 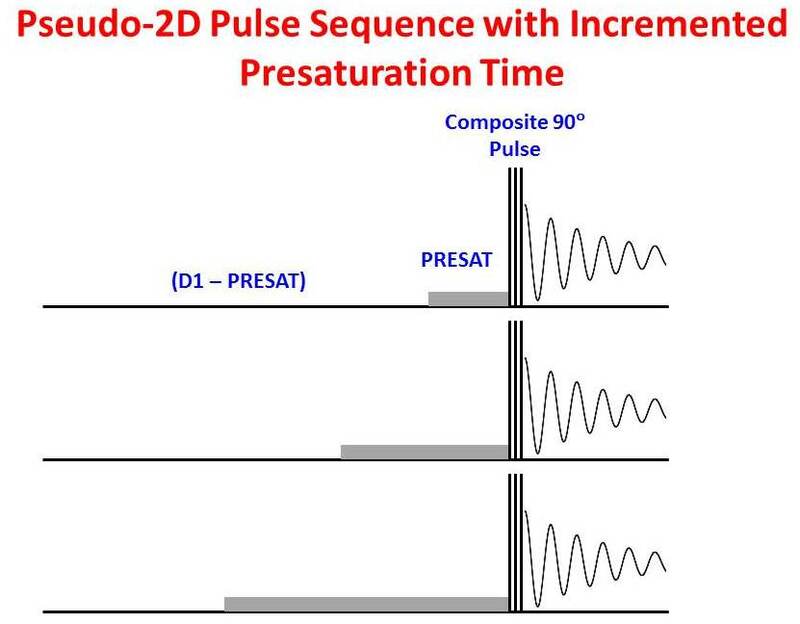 To determine an appropriate saturation time experimentally, one can run a pseudo 2D saturation pulse sequence like the one in the figure below. This sequence uses a recycle delay, D1, which is the sum of the incremented presaturation time and a resting delay. Each FID is Fourier transformed but no Fourier transform is done with respect to the incremented presaturation time. 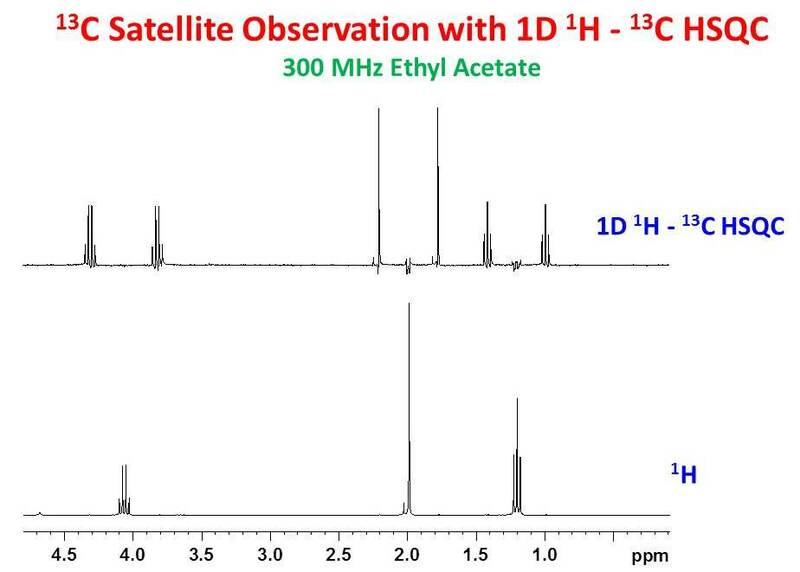 The result of this sequence for a plant extract dissolved in H2O/D2O on a 300 MHz spectrometer using a saturation power of 38.4 Hz (54 dB) and a recycle time, D1, of 5 seconds is shown in the figure below. A partial proton spectrum is displayed on the horizontal axis with the saturation time on the vertical axis, incremented in 50 msec steps. Several selected 1D spectra are shown on the right with the vertical scale adjusted such that the water signal at 4.7 ppm is at full-scale. 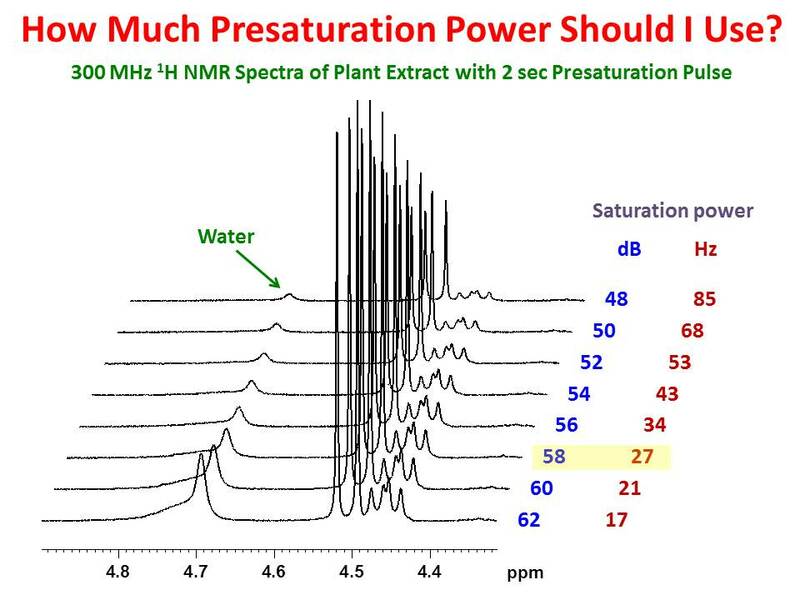 Clearly, resonances of the plant extract at 5.08 ppm, 4.51 ppm and 4.48 ppm are independent of the saturation time, whereas the water signal decays as a function of saturation time. For saturation times between 0 and ~1.3 sec, the intensity of the water signal follows a decaying sinusoidal curve with positive or negative phases depending on the duration of the saturation pulse. For the saturation power used in this measurement, the 90° pulse is 6.5 msec therefore the trend observed is not the primary 1H nutation curve but results from sampling the primary nutation curve in 50 msec increments. Since the Nyquist sampling condition is not met with sampling intervals of 50 msec, one observes an aliased nutation curve with a much lower frequency. The overall decay is due to relaxation and B1 inhomogeneity. After ~1.3 seconds, the water signal is saturated and the data are invariant for longer presatutation times. These data suggest that the minimum saturation time should be set >1.3 sec. With the recent re-emergence of low-field NMR spectrometers at proton frequencies of 40, 60, 80 and 100 MHz, many younger NMR users (who have grown up with high-field spectrometers) are encountering more and more second-order spectra. These spectra are observed when the frequency difference between signals is comparable to the coupling between them. On a 600 MHz spectrometer, 1 ppm in a 1H spectrum = 600 Hz while on a 60 MHz spectrometer, 1 ppm in a 1H spectrum is only 60 Hz. Unlike frequency differences between signals (in Hz) which depend on the field strength, the coupling between signals (in Hz) is field invariant. Easily interpreted first-order spectra on high-field instruments can be information rich but much more complicated second-order spectra on low-field instruments. 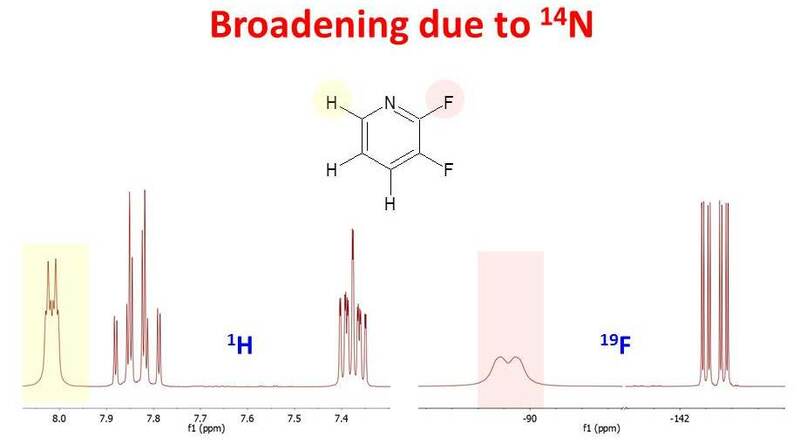 The figure below shows simulated 1H NMR spectra of a fictitious isolated ethyl group as a function of field strength. The difference in chemical shift between the -CH3 and -CH2- signals is 0.5 ppm and the 3JH-H coupling constant is 10 Hz. The spectra are plotted on a ppm scale on the left and on a Hz scale on the right. At higher fields, one immediately recognizes the familiar triplet and quartet. At lower fields, the spectra are much more complicated. The signals are closer to one another (in Hz) and therefore have more second-order character as the frequency difference between signals becomes comparable to the coupling between them. How Much Presaturation Power is Needed? 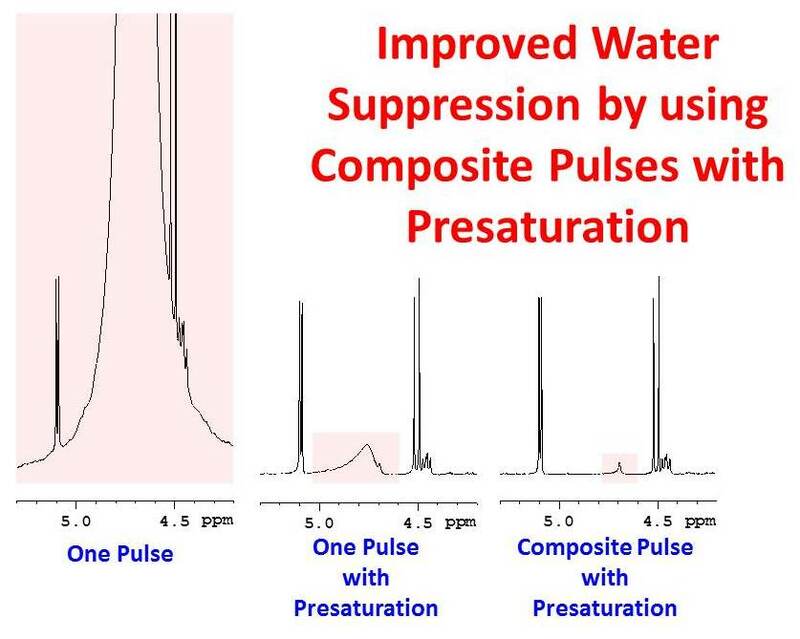 Measuring 1H NMR spectra of samples in water (or mixtures of H2O and D2O) usually requires some form of solvent suppression of which selective presaturation is the most common method. In this technique, a long low power selective pulse is applied before the high power excitation pulse (or composite pulse). If too little power is used for presaturation, the water signal will not be sufficiently suppressed. If too much power is used, one loses intensity of signals close to the water resonance and foregoes the quantitative nature of the NMR data. 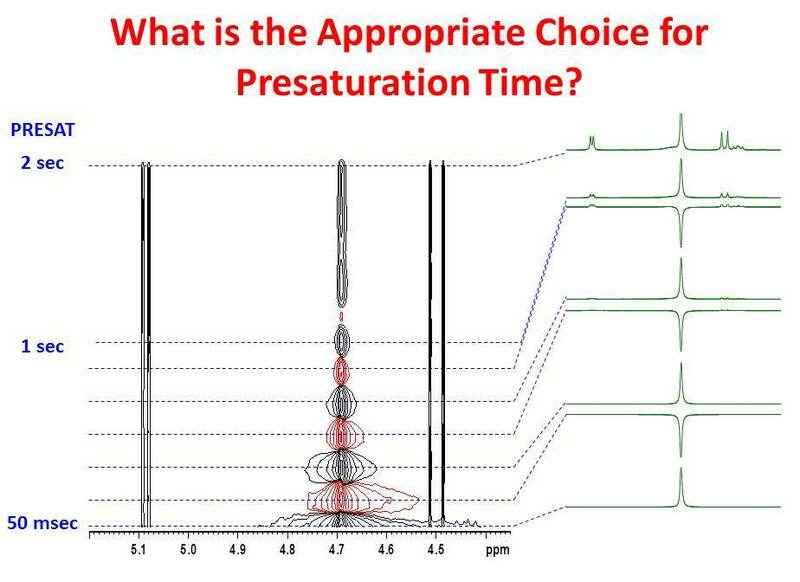 The question then arises as to how much power is required for presaturation. 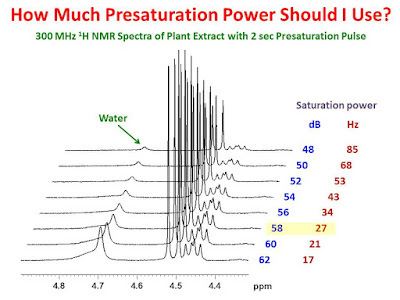 The figure below shows the 300 MHz 1H NMR spectra of a plant extract in H2O/D2O measured as a function of presaturation power. The data were acquired on a Bruker AVANCE II console with the Bruker zgcppr pulse sequence using a two second presaturation pulse. The power levels are reported in dB and Hz. One can see that at higher presaturation powers, one loses intensity for peaks near the water signal. In this case, where the nearest resonance of interest is 52 Hz from the water signal, one can obtain unattenuated signals with a presaturation field strength of 27 Hz. This corresponds to 58 dB on this instrument. A hard rf pulse delivers an rf field to the NMR sample inside of the coil. The rf field is not perfectly homogeneous nor does it end abruptly at the edge of the coil. When a long, selective, low power presaturation pulse is given to suppress a water signal, the water in the coil may be fully saturated whereas water outside of the coil will not be. Furthermore, unsaturated water outside of the coil may be outside of the carefully shimmed region of the magnet and give rise to a broadened residual signal when presaturation is used prior to a hard 90° excitation pulse. 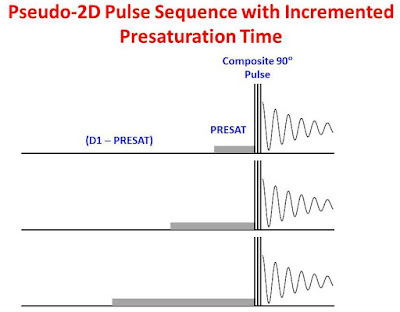 One long known* way to avoid this residual broad signal is to use a composite 90° pulse after presaturation. One of the simplest such pulses is a (90°x - 90°y - 90°-x - 90°-y) composite pulse which is designed to excite sample inside of the coil but not outside of the coil. 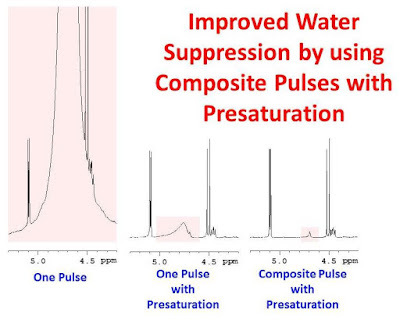 As a result, when it is used after a water presaturation pulse, it will not excite the broad signal from the unsaturated water outside of the coil and it will provide a spectrum with better presaturation performance. The figure below shows a small portion of the 1H spectrum of a plant extract in H2O/D2O. The water signal is highlighted in pink. The left panel shows a conventional spectrum acquired with a 90° pulse. The center panel is a spectrum of the same sample where a two second low power presaturation pulse preceded the 90° hard pulse (Bruker pulse program = zgpr). One can see that most of the water is suppressed from the presaturation pulse however, a broad water signal remains from the water outside of the coil. The spectrum in the right-hand panel is the same as that in the center except that the 90° pulse was replaced with a composite 90° pulse (Bruker pulse program = zgcppr). Clearly, the broad signal from the unsaturated water outside of the coil is essentially gone providing a spectrum with much better water suppression. *A. Bax. J. Magn. Res. 65, 142 (1985). 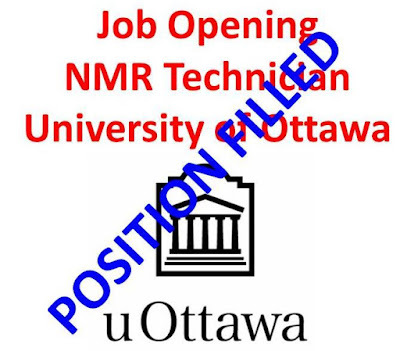 The Faculty of Science of the University of Ottawa is seeking a technician for its very active Nuclear Magnetic Resonance (NMR) facility. The NMR facility serves more than 30 active research groups and consists of 8 Bruker NMR instruments ranging in field from 200 to 600 MHz as well as a Bruker EPR spectrometer. 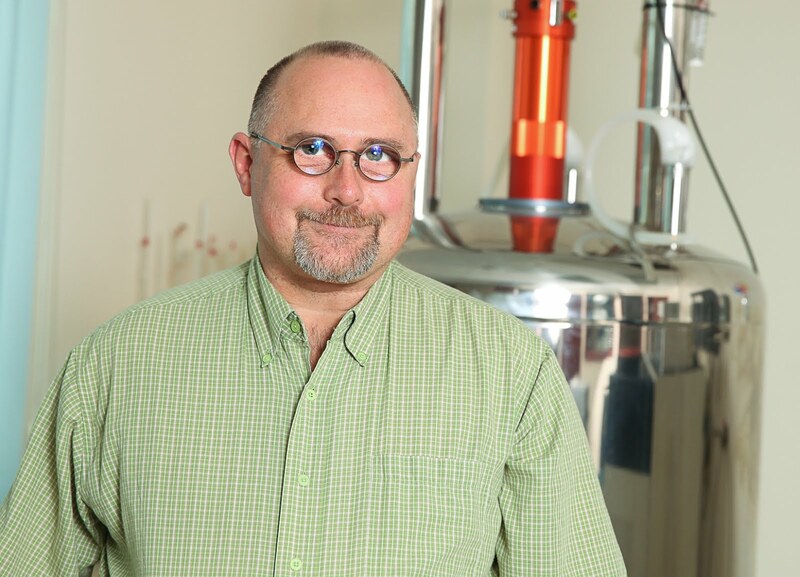 The facility conducts a wide range of modern NMR experiments on both solids and liquids. 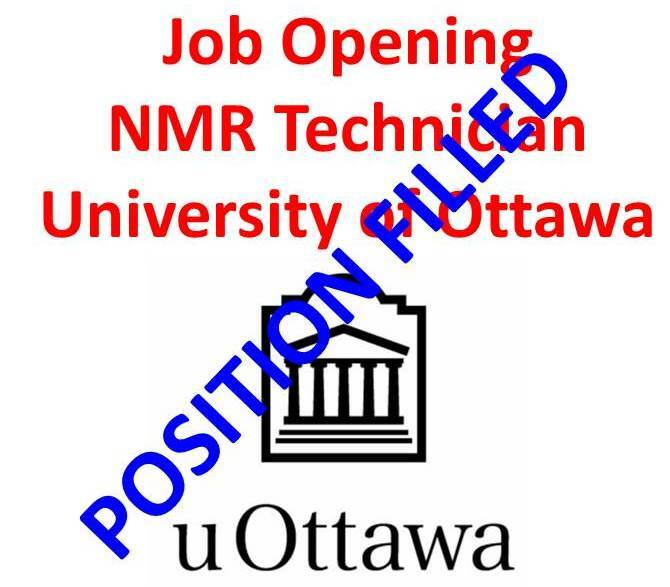 As the NMR technician, you must hold at least an M.Sc. degree in chemistry or a related field (Ph.D. preferred) with at least two years experience in either one or both high resolution or solid state NMR spectroscopy. You must be enthusiastic, highly motivated and work well both independently and in groups. Extensive computer experience is mandatory. As you will be interacting daily with students and faculty, you must have excellent interpersonal skills as well as excellent oral and written communication skills. Reporting to the NMR facility manager, you will collect routine NMR data as a service, assist students and answer questions, train new users of the equipment, fill the magnets weekly with liquid nitrogen, help with equipment maintenance (including liquid helium fills), maintain a data archive, keep accurate time and usage records, and assist the NMR facility manager in the general operation of the facility. French/ English bilingualism is a definite asset. The position begins on March 16, 2018 and is a renewable annual contract. The annual salary range for this position is $60,201 - $76,044. For consideration, please email your CV and cover letter to Glenn Facey at gafacey@uottawa.ca. Please include the names and complete contact information for three references. 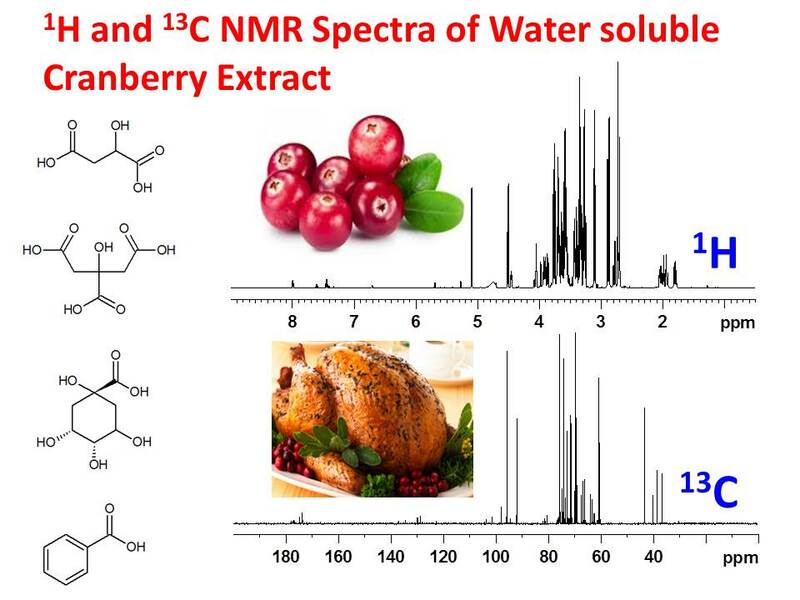 NMR of Cranberries. Why Are They So Sour? Arguably, one of the highlights of the Christmas season is a delicious turkey dinner. The most common condiment for the turkey is a tart, mouth watering cranberry sauce. Have you ever wondered why cranberries are so sour? The sour taste comes from organic acids. 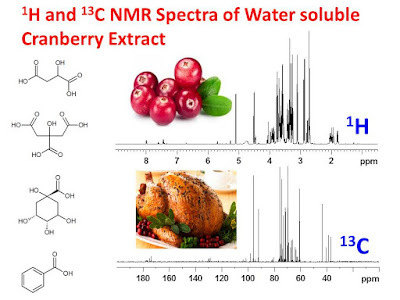 These can easily be detected in the 1H and 13C NMR spectra of cranberries. The figure below shows the 1H and 13C NMR spectra of a D2O extract of crushed fresh cranberries. Malic acid, citric acid, quinic acid and benzoic acid can easily be identified in the spectra. These account for the sour taste. Glucose, fructose and sucrose can also be identified however, the taste is dominated by the acids. There are of course many other compounds present in cranberries at much lower concentrations than the acids and sugars. Many of these account for the brilliant red color and antioxidant properties of this delicious healthy berry. Enjoy your Christmas turkey accompanied by tasty, tart, cranberries! 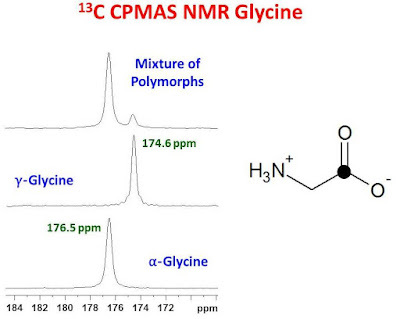 In a previous post it was shown how one could discriminate against broad NMR lines and emphasize sharp NMR lines by using a CPMG T2 filter. This technique has tremendous power for getting detailed information from difficult samples. Biological samples containing in-tact cells can be difficult because they contain semi-solid components with extremely short T2's and liquid components with dissolved compounds having much longer T2's. The CPMG technique was used as early as 1988 to study red blood cells. 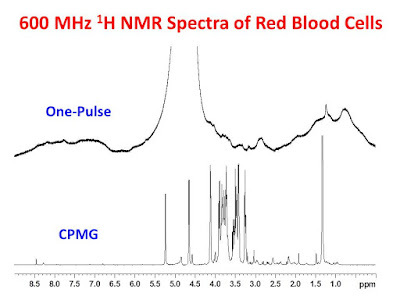 * The figure below shows 600 MHz 1H NMR data collected at uOttawa on a sample of in-tact red blood cells. The sample, obtained from centrifuged human blood, was paste-like and contained no solvent. The magnet was shimmed using proton gradient shimming and the data were collected without the deuterium lock. The top panel of the figure shows the result obtained with a standard one-pulse measurement. Clearly, the spectrum shows very little detail and is dominated by the water resonance. The bottom panel shows the CPMG spectrum obtained after 350 echos using an echo delay time (2τ = 640 µsec). One can clearly see the suppression of all the broad signals (including the water signal) with short T2's leaving the incredibly detailed and high resolution spectrum of the soluble compounds dissolved in the liquid component of the red blood cells (amino acids, sugars etc...). The water signal is almost completely suppressed. Thank you to Madeleine Adam of Dr. Robert Ben's research group at uOttawa for providing the sample. * D.L. Rabenstein, K.K. Mills and E.J. Strauss, Analytical Chemistry, 60(24), 1380 A, (1988). We have all been taught to tune our NMR probes to maximize the pulse power delivered to our sample (or minimize the reflected power back to the amplifier). This prevents damage to the amplifiers and minimizes the duration of 90° pulses at fixed power levels. This is typically done with the spectrometer hardware (eg, "atmm" or "wobb" on a Bruker spectrometer), with a sweep generator and oscilloscope or a dedicated tuning device. Tuning a probe in this way optimizes the transmission of rf to the sample, however, the NMR probe must also detect signals from the sample to be amplified and sent to the receiver. The "receive" function uses a different electronic path compared to the "transmit" function. Since the electronic paths for the "transmit" and "receive" functions are completely different, they are expected to have different tuning characteristics. A probe optimized to transmit rf to the sample is not necessarily optimized to receive the rf NMR signal from the sample. As a result, one may not be getting the optimum signal-to-noise-ratio with a probe tuned and matched in the conventional manner. The question then arises as to how can we tune an NMR probe optimized to detect and receive the NMR signals from the sample. This can be done by measuring a spin noise spectrum of the sample - using no rf pulses whatsoever. 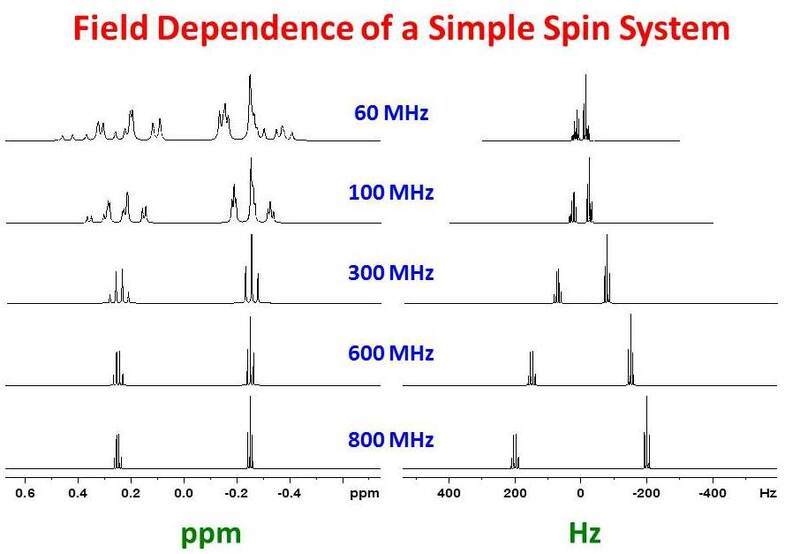 It has been shown1 that a probe is optimized to detect and receive the NMR signals when one observes an inverted spin noise NMR signal from the sample. Since the spin noise signal is measured without any pulses from the "transmit" function of the spectrometer, it depends only on the electronic path of the "receive" function. 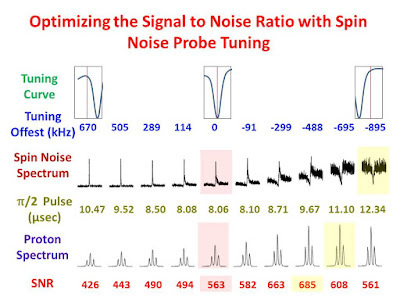 To tune a probe for optimum "receive" function, one must adjust the tuning frequency and matching of the probe followed by the measurement of a spin noise spectrum until an inverted spin noise signal is observed. The figure below illustrates an example of this using a 2 mM sucrose solution in 90% H2O/10% D2O. The proton channel of a 600 MHz cryoprobe on a Bruker AVANCE III HD NMR spectrometer was tuned and matched at 10 different frequencies using the "atmm" function of the spectrometer. The tuning offset frequencies were measured using the "wobb" display of the spectrometer. For each tuning offset frequency, a spin noise spectrum of water was measured using 64 power spectra collected in a a pseudo 2D scheme and summed to produce the spin noise spectrum displayed. 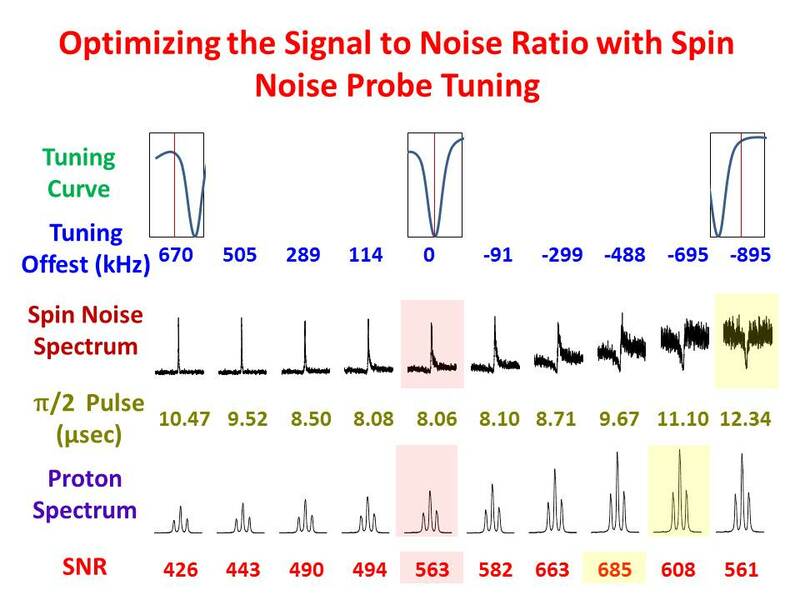 The spin noise spectrum for the probe optimized for the "transmit" function is highlighted in pink and the spin noise spectrum for the probe optimized for the "receive" function is highlighted in yellow. For every tuning offset frequency, the 90° pulse was measured with the "pulsecal" routine of the spectrometer which uses this method. As expected, the minimum 90° pulse is obtained for the probe tuned to optimize the "transmit" function. With all pulses optimized, a 1H spectrum of the sample for each tuning offset frequency was measured using excitation sculpting as a means of solvent suppression (pulprog= zgesgp). The sucrose signal at ~ 3.9 ppm is displayed in the figure. The maximum signal intensity (highlighted in yellow) is obtained at a tuning offset frequency of -695 kHz corresponding closely to where the spin noise spectrum is inverted (-895 kHz). The noise levels in the spectra were found to vary somewhat at higher tuning offset frequencies. As a result, the maximum signal-to-noise-ratio (highlighted in yellow) was observed at a tuning offset frequency of -488 kHz. This represents a 21% improvement in the signal-to-noise-ratio compared to that observed for a probe tuned in the conventional manner (highlighted in pink). The degree of solvent suppression using excitation sculpting was also found to deteriorate at higher tuning offset frequencies. In conclusion, one can obtain spectra with higher signal-to-noise-ratios by using a tuning offset frequency other than zero. One expects the specific optimum tuning offset frequency to be probe, instrument and sample dependent. This phenomenon is described much more elegantly in the reference below. 1. M. Nausner, J. Schlagnitweit, V. Smrecki, X. Yang, A. Jerschow, N. Müller. J. Mag. Res. 198, 73 (2009). The pleasingly symmetric and narrow Lorentzian resonances in a high resolution NMR spectrum are truly things of stunning beauty, appreciated by all NMR spectroscopists. Their majesty depends on the homogeneity of the NMR magnet around the sample. 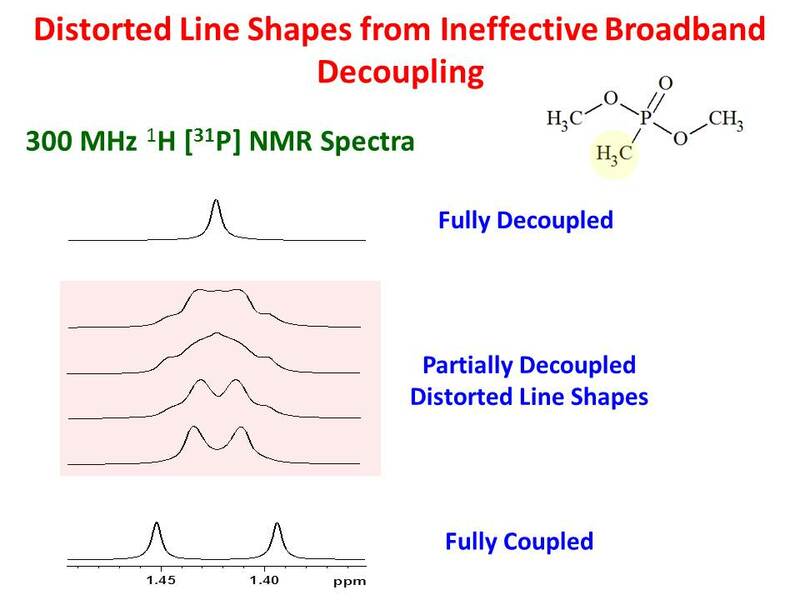 Inhomogeneous fields yield low resolution NMR spectra with broad asymmetric peaks pleasing no one. 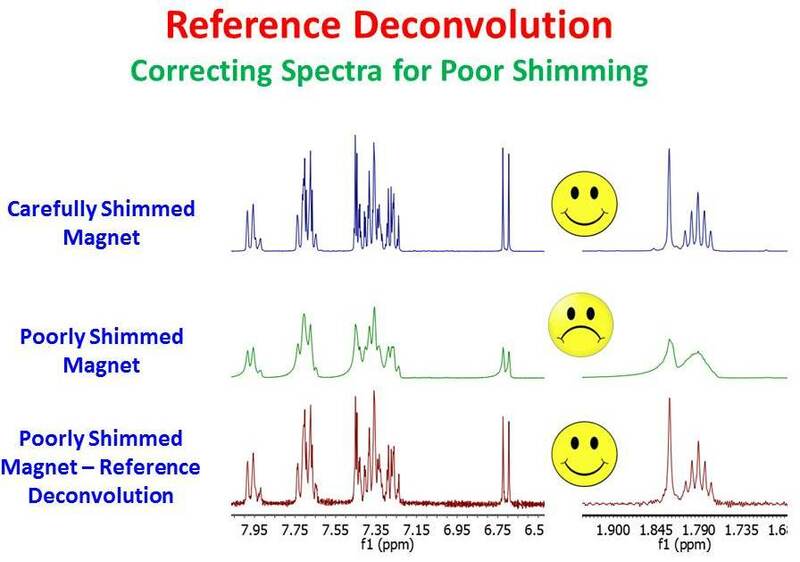 These repugnant, distasteful spectra are often obtained when automatic shimming routines are used on under-filled samples, samples with solids present (precipitates, floaters of suspended solids), samples with thermal gradients, poorly mixed samples etc…. Have you ever looked at such a spectrum and longed to recover the hidden beauty, resolution and information you know is present in the depths of its repulsive form? In many such cases reference deconvolution is a processing technique able to help. The distortions in a spectrum from an inhomogeneous magnetic field affect all peaks in the spectrum in the same way. The imperfect FID giving rise to the offensive spectrum, FIDexp(t), is essentially a perfect FID, FID(t) multiplied by an error function, E(t), resulting from the inhomogeneous field. The corrected FID is Fourier transformed yielding a much improved spectrum. 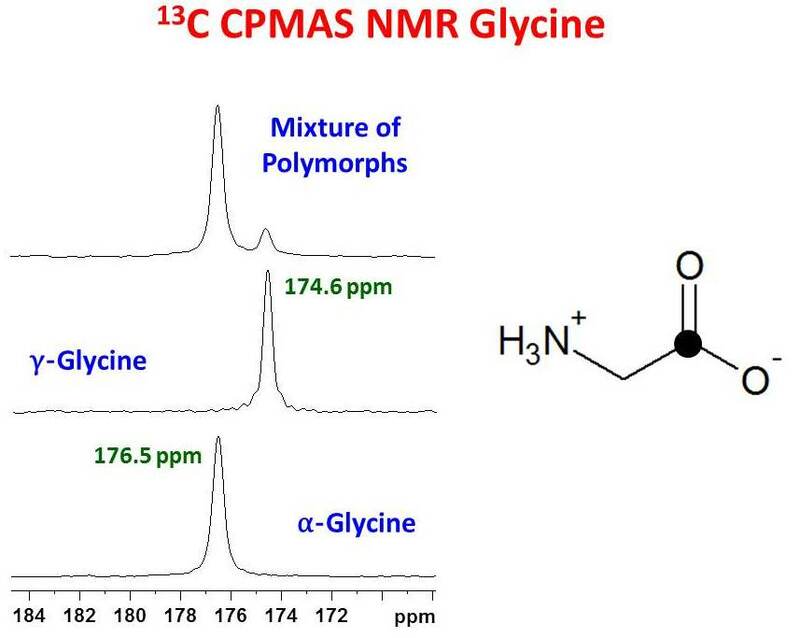 This technique is available in newer NMR software processing packages and is particularly easy to implement in the MestReNova software package available to NMR users at the University of Ottawa. 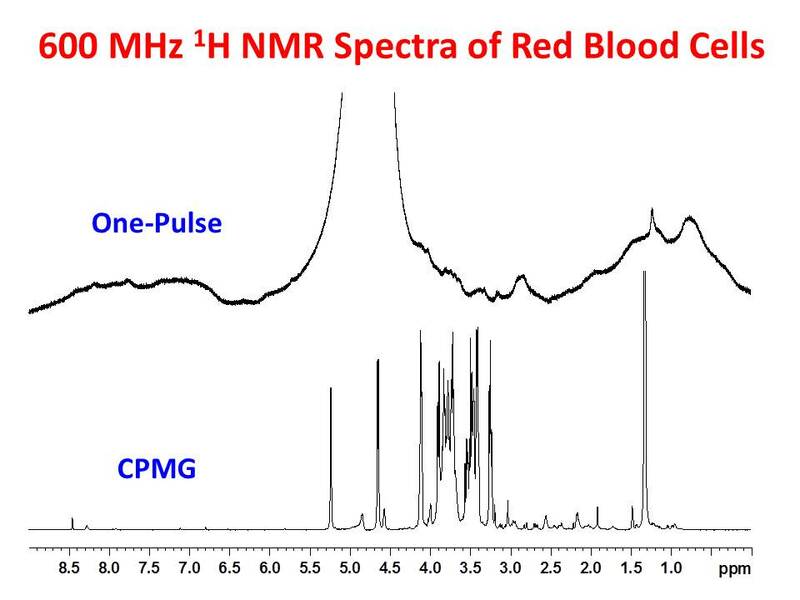 An example is shown in the figure below for a 300 MHz 1H NMR spectrum of a mixture of compounds. The top two traces show portions of the spectrum obtained in a carefully shimmed magnet. The middle traces show the same portions of the spectrum obtained in a poorly shimmed magnet. 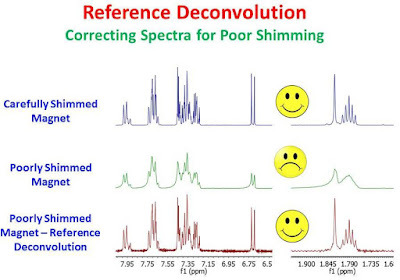 The bottom traces were obtained by applying reference deconvolution to the spectrum obtained in the poorly shimmed magnet. Clearly, there is much improvement in the reference deconvoluted spectrum, allowing one to obtain much more information and recover some of the lost beauty. In fact, the corrected spectrum is very similar to the one obtained in the homogeneous field of a carefully shimmed magnet. The penalty paid is a lower signal-to-noise ratio, as the noise from the experimental reference signal is convolved into the error function which in turn gets convolved into the corrected spectrum. The loss in signal-to-noise ratio can be minimized by choosing a reference signal with a higher signal-to-noise ratio. Recently, I had a problem with an MAS probe which would no longer allow measurement of an MAS spinning frequency. I thought it might be instructive to describe the device and the steps I took to solve the problem. 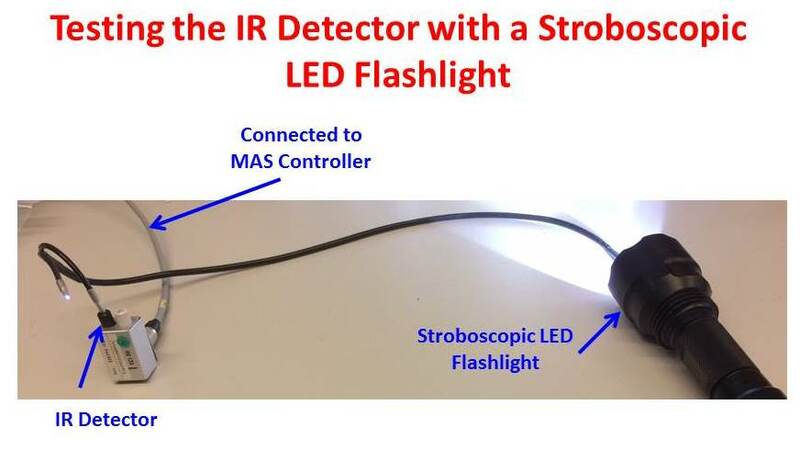 An MAS spin detection device includes an IR LED source, an IR detector, a fiber-optic cable (split in two on one end), some electronics and an MAS speed controller. Everything except the the MAS speed controller is shown in the figure below. The spin detector is connected through a three-pin cable to the MAS speed controller from which it receives power and to which it sends information about the MAS rotor frequency. The IR LED emitter inside the spin detector sends IR light through one leg of the split end of the fiber-optic cable. The IR light passes through the fiber-optic cable where it is directed towards the bottom of the MAS rotor. The position of the end of the fifer-optic cable with respect to the bottom of the rotor is very critical. The IR light must strike the bottom to the rotor. Half of the rotor bottom is marked with a black pen. When the IR light strikes the dark side of the rotor, there is very little reflected IR light "seen" at the end of the fiber-optic cable near the rotor. When the IR light strikes the white side of the rotor, most of the IR light is reflected back to the end of the fiber-optic cable and returned to the detector through one of the spit ends. When the rotor is spinning an "off" - "on" binary pulse equal to the rotor spinning frequency is returned to the detector and sent to the MAS speed controller through the electronic cable. If the device does not work, one possible problem could be that the fiber-optic cable is broken. This can happen if the cable is fastened too tightly to a support rod in the probe. It can be tested as shown in the figure below with a laser pointer or a flashlight. Almost all of the light should pass through the fiber-optic cable. Another possible problem could be a failing IR LED emitter. Unfortunately, the IR light is not visible so you cannot just inspect it visually. 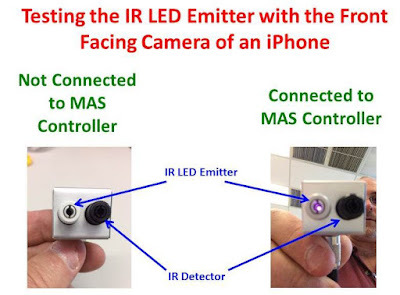 The IR light can however be detected by the front facing camera of an iPhone which does not have a built-in IR filter like the rear-facing camera. 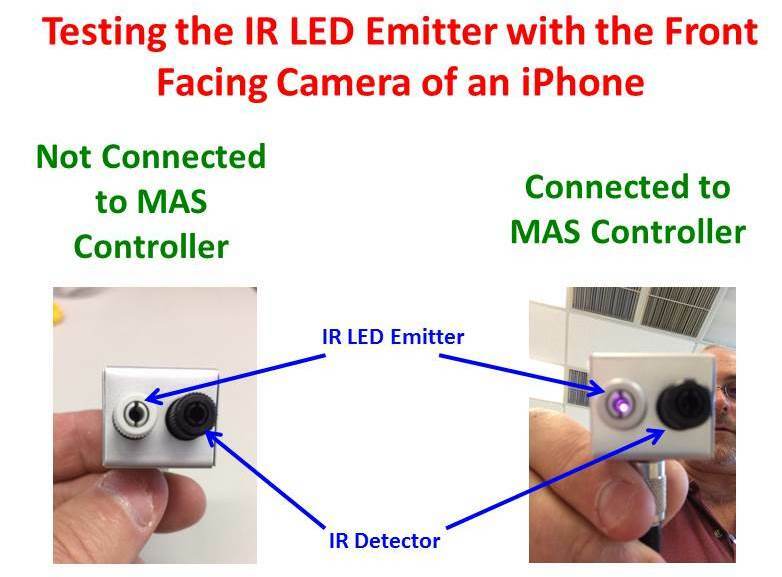 Simply taking a picture with the front facing camera will indicate whether the emitter is working. This is shown in the figure below, where the emitter is clearly visible when the spin detector receives power from the MAS speed controller but not visible when not connected to the MAS speed controller. There could also be a problem with the detector. This can be tested with a stroboscopic LED flashlight as shown in the figure below. The strobe light is positioned at the end of the fiber-optic cable and one of the split ends is positioned at the detector. When the spin detector is connected to the MAS speed controller, one should be able to observe the frequency of the strobe light on the rotor frequency display. Other possible problems could be with the MAS speed controller or with the electronic cable. I have two MAS probes for this instrument. In one probe, the MAS spinning frequency could not be counted and in the other probe it could. In the failing probe, the fiber-optic cable, IR LED emitter and IR detector were all working properly. The problem was with the connector on the cable between the spin detector and the MAS speed controller. The connection was OK for one probe but not the other. I will be happy if this post helps someone who may run into a similar problem. 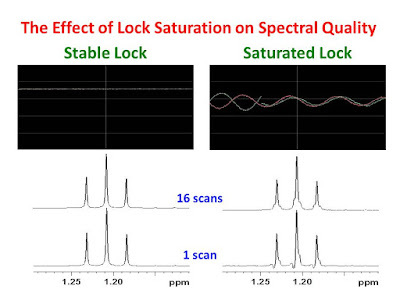 The 2H lock of an NMR spectrometer continuously monitors the frequency of the 2H resonance of a deuterated solvent used to prepare the NMR sample. If the frequency of the 2H resonance changes due to an environmental instability while the lock is engaged, a feedback mechanism is used to correct the magnetic field via a Bo shim coil, returning the 2H resonance to its original position. It is very effective at reducing (if not eliminating) environmental instability from NMR data collected over periods of time spanning minutes or hours. The effect of the lock is illustrated in the figure below. Each panel in the figure represents a contour plot of a pseudo 2D 1H NMR data set for the residual protons of D2O on a Bruker Fourier 300 NMR spectrometer. Each panel represents 2048 single-scan 1D 1H NMR spectra collected over 1.5 hours. The data in the left-hand panel were collected during the day without the 2H lock. The data in the center panel were collected in the middle of the night without the 2H lock. The data in the right-hand panel were collected during the day using the 2H lock. 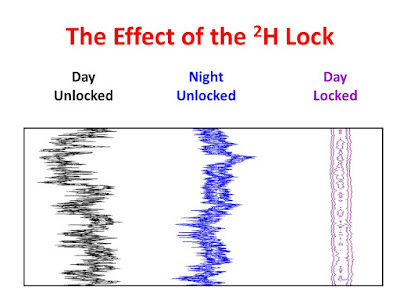 The 2H lock clearly compensates for environmental instability. There was no student traffic in the lab during the collection of any of the data. Outside of the lab are two construction sites which are busiest during the day and quieter at night. This is reflected in a comparison between the left-hand and center panels of the figure. 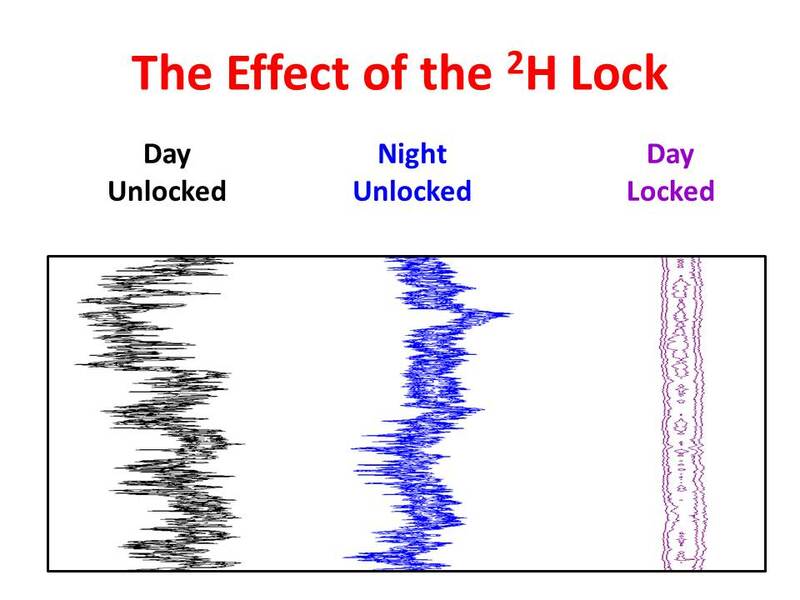 The data collected in the middle of the night without the 2H lock show somewhat less instability compared to similar data collected during the day. 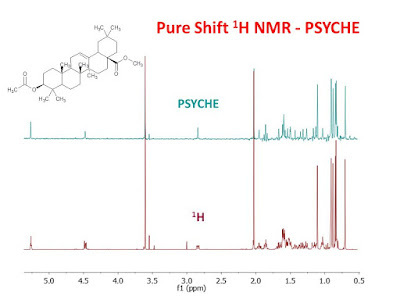 NMR spectroscopy is an indispensable tool for assigning the structure of organic compounds. One very useful method in the NMR toolbox is the Heteronuclear Multiple Bond Correlation (HMBC) experiment. 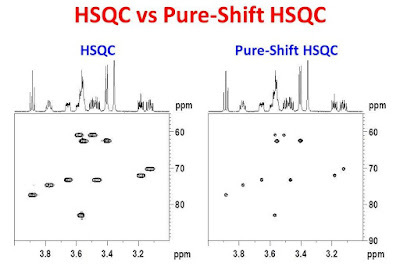 HMBC data are 1H detected and provide a 2D correlation map between 1H and 13C similar to HMQC or HSQC except that the correlations are between protons and carbons separated by two, three and sometimes even four bonds. This long range information is very helpful in elucidating chemical structures, especially those with non-protonated carbons. The problem, however with HMBC data is that the correlations depend only on the magnitude of the long-range 1H-13C coupling constants. Two- or three- bond coupling constants are very similar in magnitude to one another and therefore it is not possible to distinguish between two- and three- bond correlations. Also, since many long range 1H-13C coupling constants (including two-bond coupling constants) are near zero, some correlations may be absent. These problems may make structure elucidation frustrating or impossible. The Heteronuclear 2 Bond Correlation (H2BC) experiment1 provides an HMBC-like correlation map with (almost) exclusively two-bond 1H-13C correlations. Unlike the correlations in the HMBC measurement, which rely exclusively on long range 1H-13C coupling constants, the 1H-13C correlations in the H2BC experiment rely on three-bond 3JH-H coupling between the protons on adjacent carbons. It is a combined HMQC-COSY experiment. The size of the H2BC correlations depends on the magnitude of the 3JH-H coupling constant. 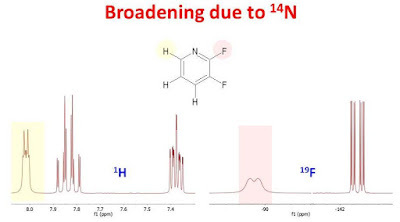 Three-bond 1H-13C correlations are possible only if four-bond 4JH-H coupling is significant. One disadvantage to the H2BC experiment is that all correlations between protons and non-protonated carbons are necessarily absent because of the absence of H-H coupling. 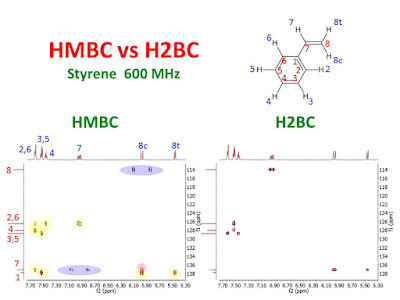 In general, two-bond 1H-13C correlations that are weak or absent in HMBC spectra are strong in H2BC spectra and three-bond 1H-13C correlations which are strong in HMBC spectra are absent or very weak in H2BC spectra. The techniques are very complimentary. The figure below illustrates the complimentary nature of the two methods for styrene. The HMBC spectrum in the left panel was scaled up until some of the HMQC artifacts (color coded in blue) were visible. The data show only one 2-bond 1H-13C correlation (color coded in pink). The three-bond 1H-13C correlations are color coded in yellow. 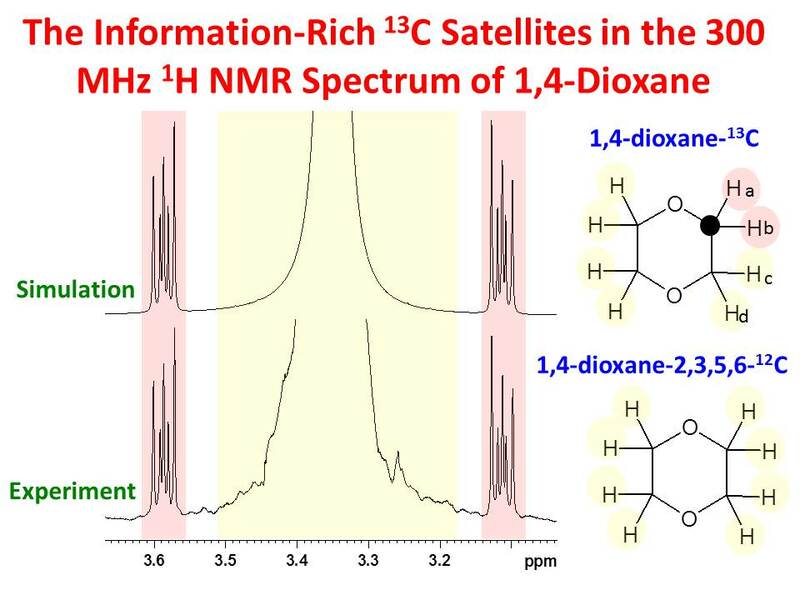 In comparison, the H2BC spectrum in the right panel shows exclusively two-bond 1H-13C correlations with the exception of those involving the C1 non-protonated carbon. 1. Nyberg, Duus, Sorensen. J. Am. Chem. Soc. 127, 6154 (2005). 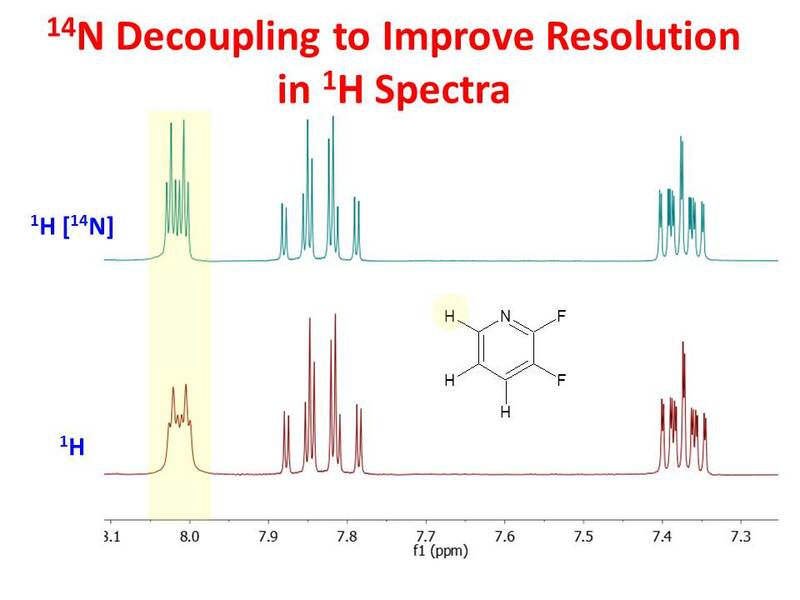 The J coupling between 13C and quadrupolar nuclides can be resolved, for example, in the cases of the 13C NMR spectra of deuterated compounds, some cobalt complexes and some tetraalkyl ammonium salts. The ability to resolve the coupling depends on the relaxation rates among the Zeeman levels of the quadrupolar nuclide with respect to the reciprocal coupling constant. When the relaxation is slow, the J coupling can be resolved and when it is very fast, the 13C is a sharp singlet and said to be "self decoupled". When the relaxation rates among the Zeeman levels of the quadrupolar nuclide are on the same order of the coupling constant, the NMR resonance of the 13C will be broadened. This is a very common observation for the 13C resonances of nitrogen bearing carbons. It is also possible to see broadened 1H or 19F resonances due to coupling to 14N. 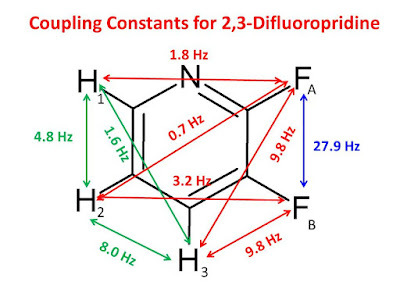 Such is the case for the resonances of the proton on C6 and the fluorine on C2 in 2,3-difluoropyridine as can be seen from the figure below which clearly shows these resonances broadened compared to the resonances of 1H or 19F further removed from the nitrogen. The broadening of the resonance of the 1H on C6 can be reduced by applying 14N decoupling during the acquisition time, thus providing much improved resolution. This is demonstrated in the figure below. 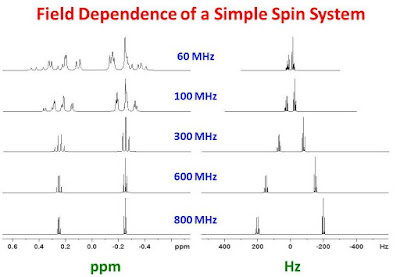 Even small molecules can yield very complex 1H NMR spectra as the result of spin - spin coupling. This is particularly true for small molecules that contain fluorine. It can sometimes be challenging to determine which splittings are due to 1H-1H coupling and which are due to 1H-19F coupling. One can collect a 1H spectrum with 19F decoupling to give a spectrum with only 1H-1H coupling present. 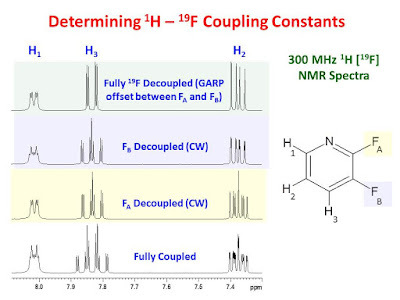 Even with this data, it may be difficult to evaluate the 1H-19F coupling constants by comparing the 1H[19F] spectrum to the 1H spectrum due to the complexity of the multiplets. The 1H-19F coupling constants can however be read directly from a 1H PSYCHE spectrum. The PSYCHE spectrum provides a 1H decoupled 1H spectrum, leaving only the 1H-19F coupling behind. The bottom trace of the figure below shows the 300 MHz 1H NMR spectrum of 2,3-difluoro pyridine. The spectrum is quite complex, making it difficult to assign 1H-1H and 1H-19F couplings. The middle trace shows the 1H[19F] spectrum which allows the evaluation of all of the 1H-1H coupling constants (3JH5-H4 = 4.8 Hz, 4JH5-H3 = 1.6 Hz and 3JH4-H3 = 8.0 Hz. 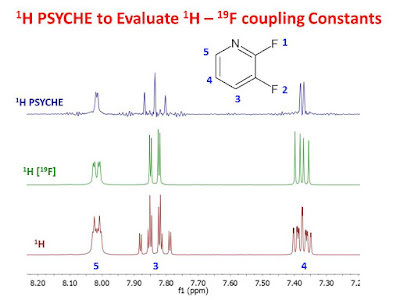 The top trace shows the 1H PSYCHE spectrum which allows one to evaluate all of the 1H-19F coupling constants. For this compound, 4JH3-F1 = 3JH3-F2 = 9.8 Hz, 4JH4-F2 = 3.2 Hz and 4JH5-F1 = 1.8 Hz. 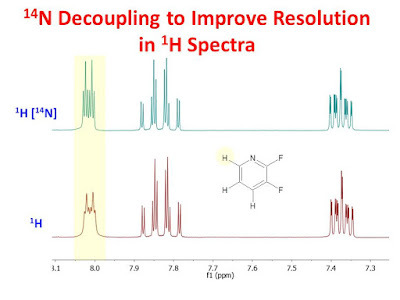 Much effort has been directed to obtain broadband 1H decoupled 1H NMR spectra. The subject has been reviewed recently.1 One technique used to obtain such spectra is the pseudo-2D Zangger - Sterk method2,3 based on a selective refocusing pulse applied simultaneously with a weak field gradient centered in the t1 evolution period allowing all chemical shifts to be measured at the same time but from different slices of the column of sample in the NMR tube. For each resonance, the coupling from all of the coupling partners is refocused. The data are collected in a conventional 2D matrix however, a single FID is constructed by concatenating a chunk from each of the individual 2D time domain signals. The Fourier transform of the reconstructed FID is a pure shift, 1H decoupled 1H NMR spectrum. The PSYCHE (Pure Shift Yielded by CHirp Excitation) modification4 of the Zangger - Sterk method uses a pair of small flip angle, frequency swept chirp pulses rather than a selective 180° pulse applied simultaneously with the weak spatially selective field gradient. This modification offers improved sensitivity. 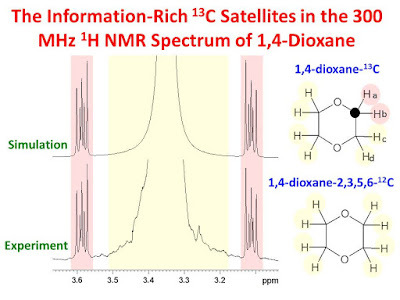 The details of implementing this technique are kindly provided on-line by the Manchester NMR Methodology Group. 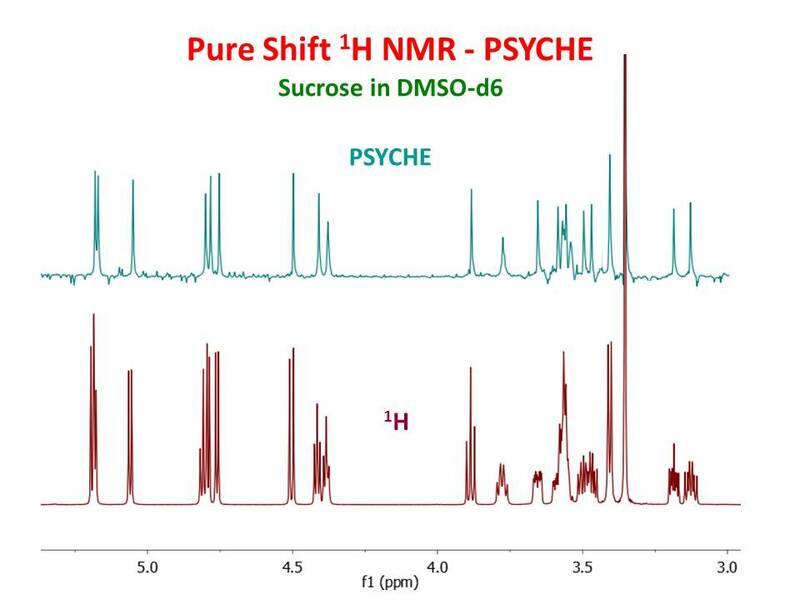 As an example, the figure below shows the 600 MHz PSYCHE spectrum of sucrose in in DMSO-d6, collected in less than 3 minutes. One can observe the collapse of all multiplets into singlets. 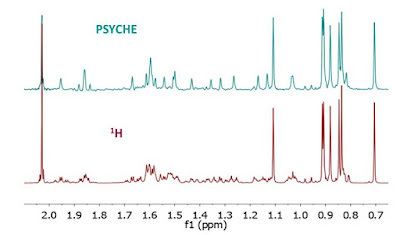 The PSYCHE technique can dramatically simplify complex 1H NMR spectra as shown in the figures below. The second figure is an expansion of the low frequency region of the first. 1. Castañar and Parella. Mag. Res. Chem. 53, 399 (2015). 2. Zangger and Sterk. J. Mag. Reson. 124, 486 (1997). 4. Foroozandeh, Adams, Meharry, Jeannerat, Nilsson, Morris. Angew. Chem. Int. Ed. 53, 6990 (2014). 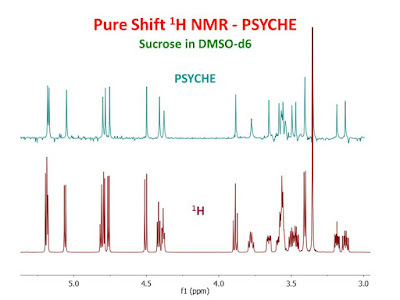 The effects of chemical or dynamic exchange on NMR spectra are very well known. Exchange is often studied by observing line shape changes as a function of temperature, by 2d EXSY, inversion transfer or saturation transfer methods. 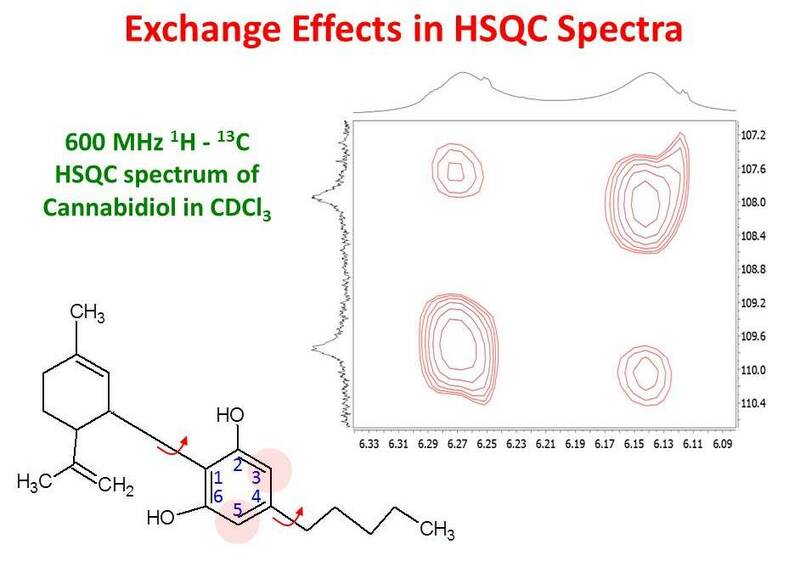 Effects due to exchange can also be observed in 1H - 13C HSQC spectra. 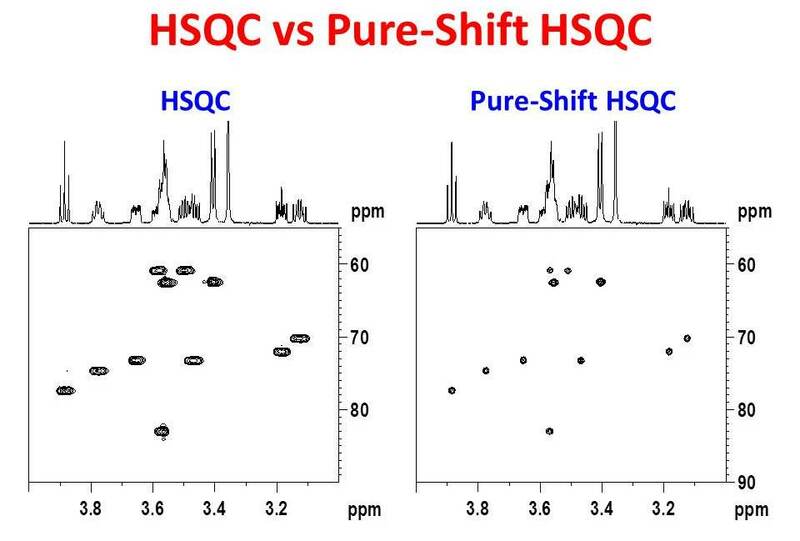 The HSQC method works by transferring 1H magnetization to 13C magnetization via an INEPT transfer through the one-bond J coupling across the 1H - 13C chemical bond. The 13C magnetization evolves during the incremented delay, t1, of the 2D pulse sequence according to its chemical shift. The 13C magnetization is then transferred back to 1H magnetization where is observed during t2. 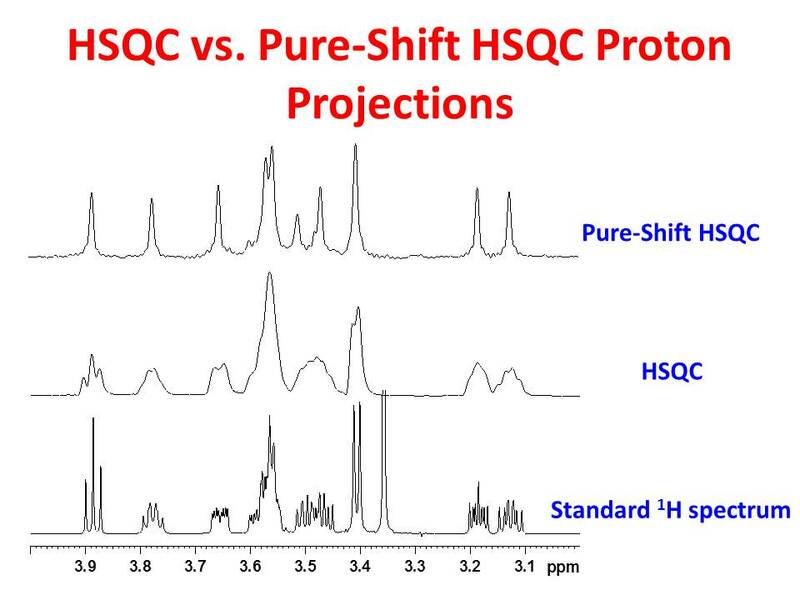 HSQC spectra thus exhibit cross peaks between 1H resonances and the resonances of their attached carbons. If there is exchange between nonequivalent carbon sites during t1, some 1H resonances may appear to be correlated to two carbon resonances. An example of this is shown in the figure below. The 13C spectrum of cannabidiol has equally intense broad, resolved aromatic resonances for non-protonated carbons 2 and 6 (not shown) as well as for the protonated carbons 3 and 5. The 1H spectrum has broad resolved resonances for both aromatic protons. This indicates that either the aromatic ring undergoes 180° flips about the 1 - 4 axis or it has two equally probable rotomers defined by a rotation about the 1 - 4 axis. In either case, the dynamic exchange is slow enough on the NMR time scale to produce resolved resonances yet fast enough to cause significant line broadening. 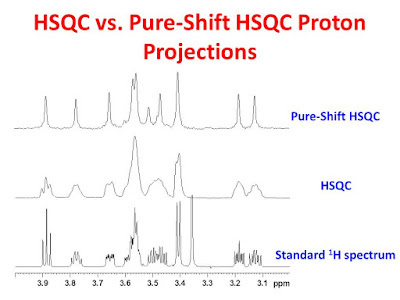 For each of the two aromatic protons, the HSQC spectrum shows correlations to both C3 and C5; a strong correlation to the carbon to which it is chemically bonded and a weaker correlation to the carbon site in exchange with its attached carbon. Maple syrup is arguably one of the tastiest traditional Canadian condiments. In honor of Canada Day (July 1), it is appropriate to take a look at this delicious golden treat. 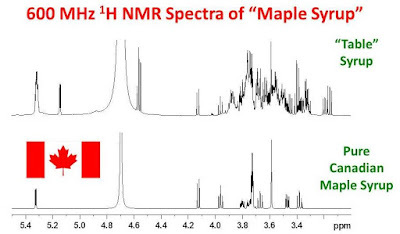 The bottom trace of the figure below shows the 600 MHz 1H NMR spectrum of pure Quebec maple syrup dissolved in D2O. The spectrum is overwhelmingly dominated by sucrose. Clearly, nature gives us the maple flavor with very low concentration components. The top trace is a similar spectrum of "table" syrup which has a taste somewhat similar to maple syrup. The spectrum is much more complicated than that of pure maple syrup. In order to mimic the flavor of pure maple syrup, the food chemists resort to a complex mixture of sugars and artificial flavors. Canada keeps it simple and of course better! Happy Canada Day.